Thursday March 29th 1923. I wrote Vene and did some fancy work. I slept the afternoon. We went to a Piano recital in the evening at Stetson Hall. A letter from Birdie. Friday March 30th 1923. Wrote Birdie and got myself and few things ready to go to Lakeland. We had early dinner and Mrs Falk and Miss Nagle took me to the station. Millie met me at Lakeland and we were soon at Mrs Emmons. Evening talking. Saturday March 31st 1923. Millie went down town with me before noon and we had dinner together before I left. Had a nice visit. Reached DeLand at 4.20. Came over town where I found Mrs Falk and Miss Nagle. Evening at home. Letter from Aunt Emma, and card from Sciota Lape. She told me Will Anderson is dead. Five years got today was Easter and Will and I was at Venes. We had come from Oklahoma City. The last time there together. Sunday April 1st 1923 Went to S S and church. Dinner in town. Wrote Amanda Anderson. Aunt Emma & Cora today. The coolest weather since I came here in January. 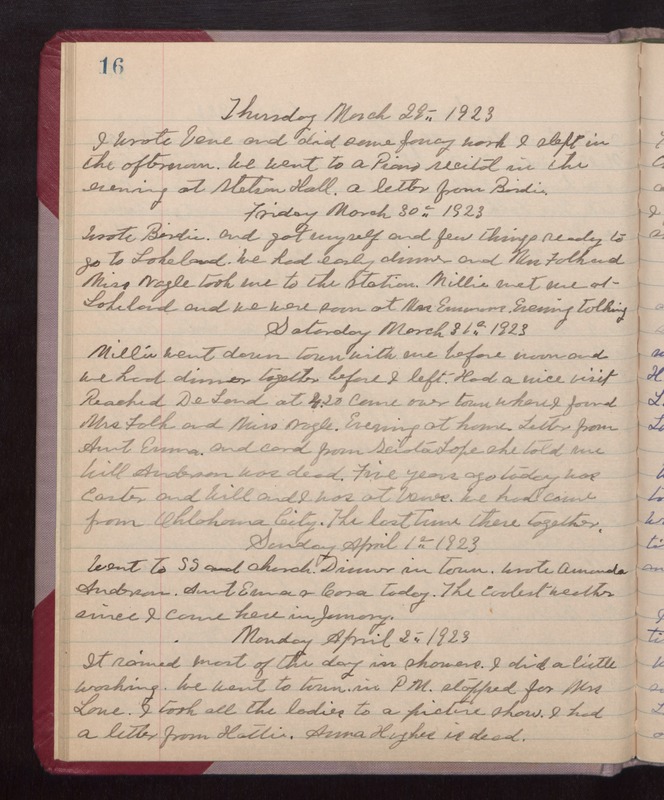 Monday April 2nd 1923 It rained most of the day in showers. I did a little washing. We went to town in PM. Stopped for Mrs Lane. I took all the ladies to a picture show. I had a letter from Hattie. Anna Hughes in dead.